My mom almost always made soup for lunch. Chicken soup, beef soup, noodle soup, alphabet soup, meatball soup and one of my favorites was this sopa de orejas, which I guess, the literal translation would be “ear soup”. But don’t be scared by the name because it really doesn’t have any ears, it’s only that the fritters end up looking like an ear after you deep fry them. We always called it “sopa de orejas” at home and every now and then we would call it “egg tortilla soup”. 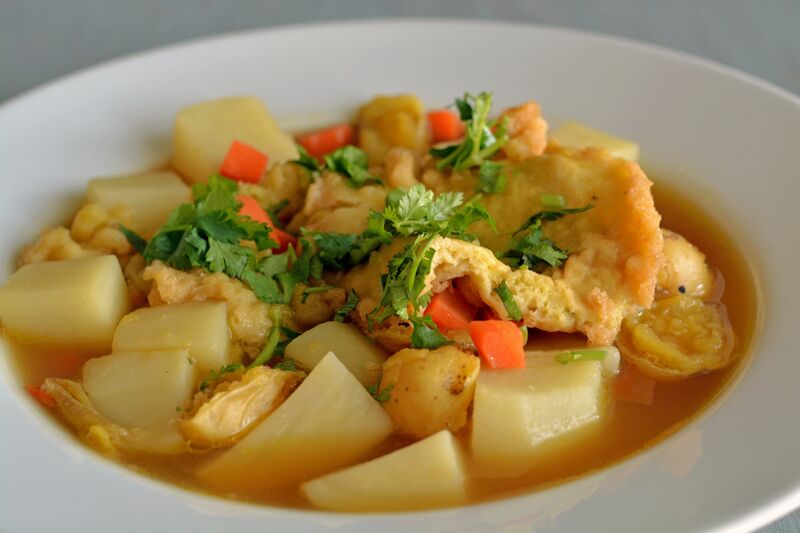 I have also noticed that in some areas they call it “torrejas soup” and it could be because it’s kind of similar to the Ecuadorian “caldo de torrejas”. In any case, it really doesn’t matter what you call it because it ends up being the same soup or simply very similar versions. 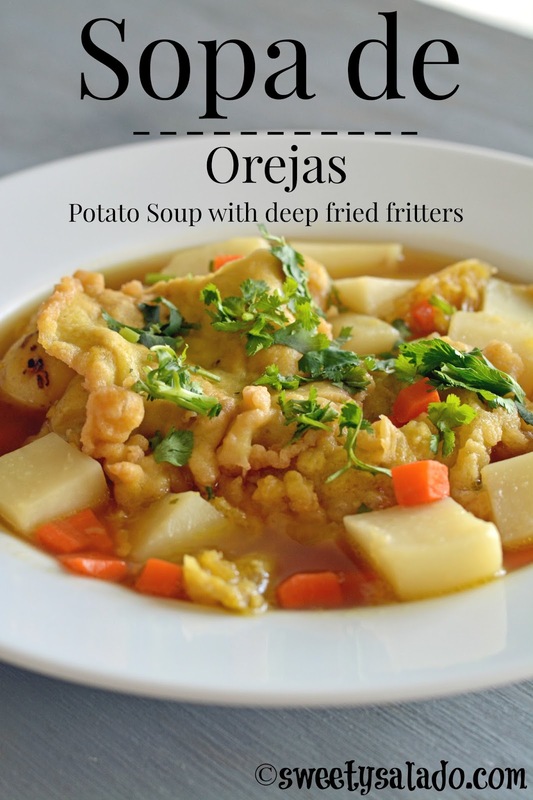 In Colombia we usually make this soup with just beef stock, potatoes and the flour fritters, which is the reason why my husband doesn’t like it very much because he’s a total carnivore. So, that’s why I end up making the fritters really big, so that he can enjoy it more. But for the most part, the fritters should be the size of a regular ear and even so, I suggest you make them however big you want. Pre-heat frying oil to 350ºF (180ºC). Whisk all of the ingredients for the fritters until you get a smooth batter. Pour 2-3 tbsp of the batter into the hot oil to make the fritters and deep fry them for about 2-4 minutes or until they're golden brown. Make sure to flip them over so that they can cook on both sides. You can make them smaller or bigger, if you want. Remove them from the oil, drain them on paper towels and set them aside. Heat olive oil on medium heat in a large pot. Add the green onion and garlic and cook for about 2 minutes. Add the carrots and cook for 1-2 minutes. Then, add the beef stock, water, potatoes and season with salt and pepper to taste. Cover and bring to a boil on high heat. 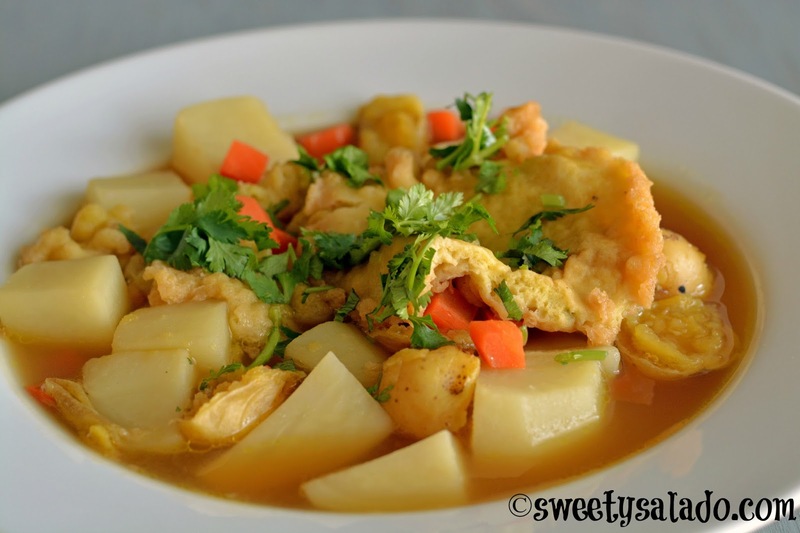 Once it's boiling, reduce to low heat and cook for about 20-25 or until the potatoes and carrots are tender. Add the fritters into the soup and cook for another 10 minutes. Serve immediately with the cilantro and avocado.